Direct from London. Danny DeVito and Judd Hirsch together again for the first time on stage. 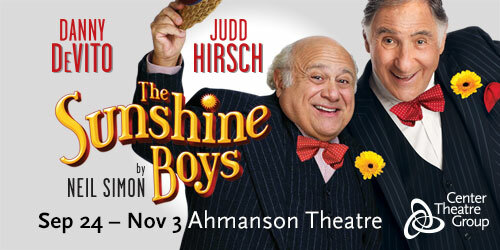 The laughter hits the ceiling when Golden Globe and Emmy Award winner Danny DeVito joins Tony Award® and Emmy Award winner Judd Hirsch to tear it up in this outrageous new production of the Neil Simon classic. At the pinnacle of Vaudeville, Al Lewis and Willie Clark were the undisputed Kings of Comedy before splitting unceremoniously. But when CBS attempts to re-unite the legendary double bill for a once-in-a-lifetime television special, the shtick hits the fan when old grudges begin horning in on the act. This U.S. premiere direct from London directed by Olivier Award winner Thea Sharrock stokes the heart and the funny bone in a show about show business and the true measure of friendship.